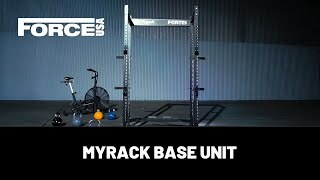 The Force USA MyRack Deluxe J-Hook is an upgrade from the Standard J-Hook also available. The Deluxe version is a bulky and stronger J-Hook, weight rated to 1200kg (static tested). The Deluxe version also includes nylon that covers the entire face of the J-Hook, unlike the standard which nylon only covers the inside of the J-Hook. With safety being our number one priority, the MyRack J Hooks also feature a unique welded support bracket under the J hook to provide an added degree of safety and structural integrity.